Austin is a 2011 graduate of Kamehameha Schools Kap?lama and currently a senior at Western Washington University, where he is studying as a Geophysics and Computer Science major. He will be continuing his education by pursing a graduate degree in Computer Science. His primary interests include big data, machine learning, and mobile application development. Austin’s interests outside of academics are weight training, soccer, producing music and playing video games. 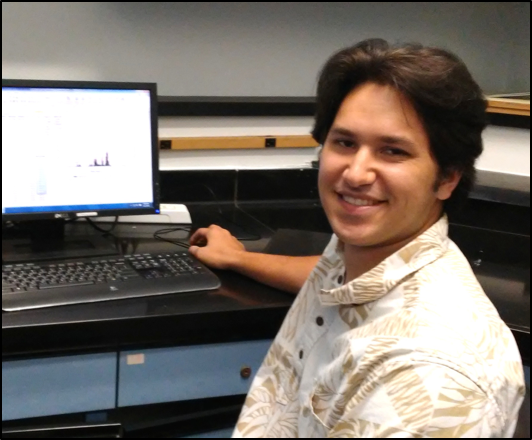 He hopes to one day pursue a career in STEM in Hawai‘i as well as become an advocate to the youth of Hawai‘i for pursuing their passions in STEM. The NOAA US Coral Reef Conservation Program is concerned with how runoff from the state of Hawaii will affect coral reefs in the area. Sediment and algae can block light and absorb heat, which will increase ocean temperature, decrease photosynthesis and therefore decrease dissolved oxygen levels in water, stressing coral reefs and other aquatic life. The purpose of this research is to investigate statewide water quality field data and VIIRS (Visible Infrared Imaging Radiometer Suite) ocean color data in order to assess their potential as a water quality-monitoring tool for Hawaii’s watershed managers. Tabular rainfall, chlorophyll-a and turbidity field data were organized and distributed into weekly, monthly, and yearly averages using Microsoft Excel and Java. Using ArcMap’s spatial analyst toolbox, the plotted field data point values were interpolated into spatially resolved raster maps. VIIRS ocean color data were then imported, mapped and projected in ArcMap using the netcdf conversion tool. Once the data were successfully mapped for the state of Hawaii, closer scoping and mapping was done for a regional location off the Kona coast at NELHA. The low resolution of satellite data as well as the sparse state-wide field data indicate that the field data and the satellite data are both insufficient to be used as tools for monitoring runoff from the state of Hawaii. Comparable anomalies between the satellite data and field data were unidentifiable and therefore no conclusions could be made. In order to further assess the potential of VIIRS in monitoring runoff from the state of Hawaii, more field water-quality data must be collected at a higher frequency. Furthermore, higher resolution satellite data would provide a closer look along the coastline of Hawaii, where local runoff is typically identified. The minimum satellite resolution necessary to identify local runoff could be determined by sediment plume extent modeling conducted around the state.